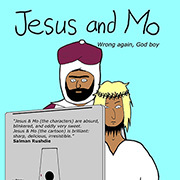 Jesus and Mo will be back in January. Peace and blessings be upon you. Happy Birthday Jesus and Happy Eid Mo. Well done Author. My cartoon series of the year. I am off to Comet now to get me a new irony meter (mine exploded with a resounding spoing when I read about homeopaths bringing dead people back to life). Ironic also that if you use Google Trends and put in “GOD” the number of hits goes down every Christmastime. Ah, those cheap Taiwanese Irony meters. Any Italian or US-made Irony meter wouldn’t have broken under such a mild barrage of confumbling statements! Where can I order Irony meters? living in a catholic country (Colombia) reselling and repairing can be a very lucrative business. Thanks for all the laughs this year. Merry SPOING to one and all. Hahaha, the irony meter joke never gets old! I’d invested in a super industrial-strength irony meter, but it melted after the Pope’s comments were reported this morning. Poor Richard wishes you all, believers included and especially, a more enlightened new year. I will miss the irony meter! I wonder if the “ACME” company from Road Runner is the manufacturer of the infamous Irony Meter? Don’t get me started on the religious analogies of our favorite cartoon characters. We all know there is evil living there…..Anyway happy holidays Author please rest up for ’09!!!!!!! To modify one of my favorite phrases, “When a year passes, we should say something good about it”. 2009 has no where to go but up, how ironic. I wish there was a rating thingy on here. I’m getting the urge to give every strip 100%. Joy and Peace, one and all. Just think, as long as we have the religious giving us no peace, we will have the joy of the author’s commentaries to compensate. week, just a moment in the bigger scale of things. which side of the bathroom door you’re on. Thanks for the many many laughs all year. 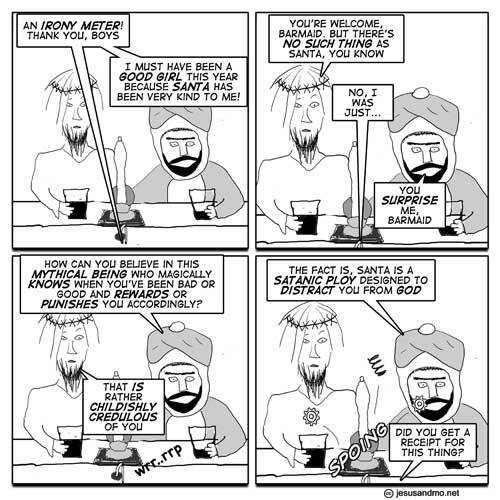 “A Catholic priest has been criticised by parents in a city in northern Italy for telling their children that Father Christmas does not really exist. I read that shpalman and wondered what if I were to go into a church and tell the congregation that their god is just a fairytale and just a means to keep them under control and that I feel it my duty to inform them of this. Argh, it’s not worth it! Reason’s greetings author. Thanks for another year of great humour. Thanks – it’s been a laugh. Meanwhile what am I supposed to do with this busted irony meter?! I want a working irony meter! It’s no fair. Thank you Author for the laughs and down-right cleverness. Much looked forward to and appreciated. I am still picking the pieces of my irony meter out of the wall following the Pope’s message. Thanks for the laughs author. The Irony-meter as deus ex machina, splendid! Hope everyone had a grand Winter Solstice Holiday! Hey Art, those little squiggley things you change everytime you put up a new picture are interesting. Some of them block my view of the Barmaid’s body, but those others…., those others, what they’ve shown of her mind…Open, poured small puddles on the table…Stirred and swished and finally left to grasp idea’s form…. (MY GOD! !… HAVE YOU NO DECENCY?? )…settle, settle…The first scene sown’s worth all its fellows…Follows on are strong, firm, mellow…Purging “Truth” with tallow, lit with sorrows deep and shallow…To air is human, live sane…. Divine. Rest well, cherished petal. Hyoid seems to have missed the message about avoiding the brown acid. That is TOO funny! You’re going to get me fired for laughing too loud (and I’m working at home today!) Awesome. The brown acid….I figured that was what the Author imbibed in order to conjure up all of these wonderful (4 pane) funnies!!!!! It’s January. Where are they? Can’t cont-i-n–u–e— g–e–t–t–i–n—g w—e—-a——k!! N-e-e-d m-o-r-e J-e-s-u-s a-n-d M-o…………..